Oh Deliverance. I had a love and hate relationship with this book. Let me give some background first. When I read review books that are a part of a series- I usually have a year or year and half wait between books. This either makes me anticipate the book even more, or in some cases, lose interest in the story. The second book in this series was a powerhouse for me. I remember feeling full of emotion and very tense as I was reading it. This one, for the most part, was mild boredom. Was this a good story? Absolutely. Did I have trouble connecting to it because I forgot what the store was about. Yes. (This is where the Recaptains usually get involved for me). Rachel is a fierce fierce lady and I loved reading her story. I think my real problem was Logan. I really didn't care about him and didn't want to read the story from his voice. I honestly can't remember if that was a problem I had in the other books in this series, but I have a sneaking suspicion that I felt pretty similarly about him in the other books. It isn't that I don't like him- I do. I just don't want to hear the story from his voice because he complains, worries, and whines too much. I would have been happy to hear the story only from Rachel's P.O.V. I will say that I enjoyed the climax of the storyline in this book. There is a lot of fighting and a lot of bleeding in this book (much like the other books in the series.) The author is masterful at writing fighting scenes and I really did enjoy reading them. 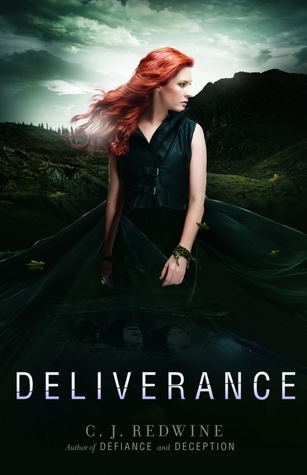 All in all Deliverance was a decent book. It simply didn't have the explosiveness that I wanted out of the finale.